The US-company Accuflight Inc. now manufactures the big brother of the handy Easy-Stik Pro, the so-called Magnum version. Due to its size it can not be thrown as easily as the Pro version, and is not suitable for indoor fun. With its 26cm (plus 10cm tail), the implement resembles a spear, its 270g lying good in your hand. 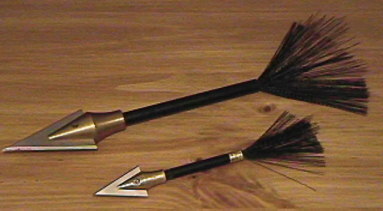 The blade and brass head together are 12cm long. The best results are still achieved if you throw the knife like a dart. Throwing it underhand (your hand coming up) or like an ordinary knife will impart more speed, I achieved a distance of 16m this way. The tail stabilizes the flight nicely, you can see that it wiggles in the beginning and then comes to a rest. Aiming will be possible for a maximum distance of 10m (which is not bad at all). The knife will only stick in wood if not thrown too hard, it bounces back out otherwise. Generally speaking, I found the "Magnum" too big and dangerous to play around with. The blade should be protected with the included Kydex sheath when not in use. And using the dart for hunting, like the manufacturer suggests, is out of question in most parts of Europe! Meanwhile, the manufacturer has ceased producing the Easy-Stik Magnum.